Hence, an additional facility will be built at Riley. 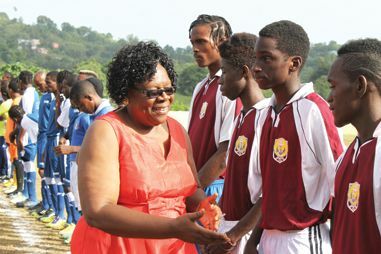 Parliamentary representative for the Marriaqua constituency Girlyn Miguel made this disclosure as she addressed the opening of the Hairoun Beer Kirk Da Silva Marriaqua Football Competition last Sunday afternoon at the Cane End Playing Field. The parliamentary representative added that the Cane End Playing Field has suffered from erosion over the years, because it was excavated from a relatively high mound, in order to get the surface area. Both the Richland Park and Cane End playing fields were among several upgraded under the Social Investment Fund programme during 2008 and 2010. The Richland Park facility was widened; re-grassed and had a hard court added. Among the upgrades done to the Cane End playing field were the grassing of field, installation of some drains, the refurbishing of an existing pavilion, the erection of a structure which houses a bar, store room, toilets, and gallery to seat officials, as well as work on the perimeter fence, including the gates.